Vaults are the crypto equivalent of a savings account. If you have crypto assets that you don’t plan to spend/send frequently, you can put them in vault and get increased security. Coinbase has had a vault offering for Bitcoin for the past three years and they have now launched the same vault product for ETH and Litecoin. 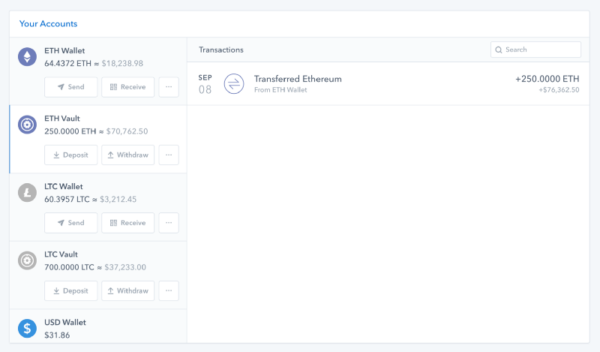 With the vault, you get a 48 withdrawal period (so nobody can move funds out of your account for 48 hours) and multiple signers on a withdrawal. You can have three signers and require all three to sign a withdrawal or you can set up five and require three of five to sign a withdrawal. I like to keep some crypto assets in my wallet and the rest in a vault. It is more secure. If you have crypto assets at Coinbase, I encourage you to set up vaults for them.